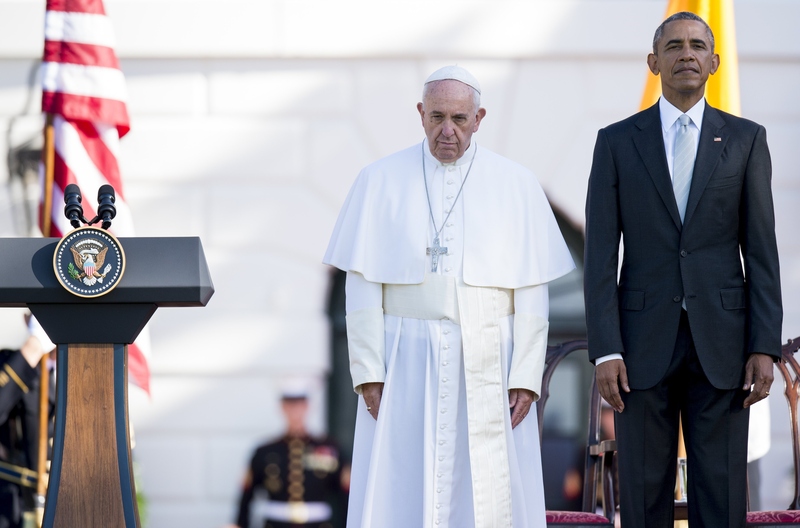 In historic remarks Wednesday morning, Pope Francis gave a speech at the White House, touching on the ongoing problems of climate change and inequality and graciously thanking the Obama administration and the United States for hosting him. He also referenced the immigration reform it's no secret that the United States needs, pointing out in his opening remarks that the country was built on a foundation of immigrants. Mr. President, together with their fellow citizens, American Catholics are committed to building a society which is truly tolerant and inclusive, to safeguarding the rights of individuals and communities, and to rejecting every form of unjust discrimination. With countless other people of good will, they are likewise concerned that efforts to build a just and wisely ordered society respect their deepest concerns and their right to religious liberty. That freedom remains one of America's most precious possessions. And, as my brothers, the United States Bishops, have reminded us, all are called to be vigilant, precisely as good citizens, to preserve and defend that freedom from everything that would threaten or compromise it. Mr. President, I find it encouraging that you are proposing an initiative for reducing air pollution. Accepting the urgency, it seems clear to me also that climate change is a problem which can no longer be left to a future generation. When it comes to the care of our “common home,” we are living at a critical moment of history. We still have time to make the changes needed to bring about “a sustainable and integral development, for we know that things can change” (Laudato Si’, 13). Such change demands on our part a serious and responsible recognition not only of the kind of world we may be leaving to our children, but also to the millions of people living under a system which has overlooked them. Our common home has been part of this group of the excluded which cries out to heaven and which today powerfully strikes our homes, our cities and our societies. To use a telling phrase of the Reverend Martin Luther King, we can say that we have defaulted on a promissory note and now is the time to honor it. We know by faith that “the Creator does not abandon us; he never forsakes his loving plan or repents of having created us. Humanity still has the ability to work together in building our common home” (Laudato Si', 13). As Christians inspired by this certainty, we wish to commit ourselves to the conscious and responsible care of our common home.